For guests looking to taste wine under the Tuscan sun, relax on a cruise over the turquoise-blue waters of Croatia or take a private tour of the magnificent architecture of Spain, look no further than Insight Vacations’ extraordinary summer journeys to Europe. Insight Vacations’ exclusive “Air, Land & See” offer will give travelers the chance to experience Europe in depth with deliciously authentic dining, immersive experiences with locals and hand-picked, luxurious hotels located in the heart of the destination. Our passionate Travel Directors will be with guests every step of the way providing a seamless, magical and unforgettable experience. Country Roads of Croatia (14 days): Experience traditional village life and immerse into the pristine landscapes, national parks, idyllic islands and sun-dipped seas of Croatia on this off-the-beaten-track journey. Take a private cruise to Stonand enjoy the scenic views of the islands, where guests will will meet a local oyster farmer and learn about the cultivation of oysters before enjoying a delicious farm-totable shellfish tasting of the freshest produce. 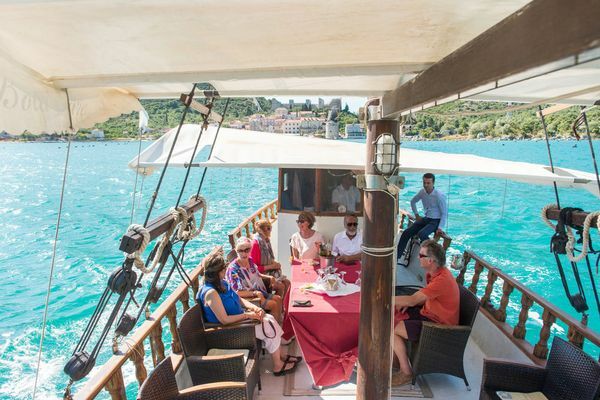 They’ll embark on city tours with local experts to explore the Renaissance-décor of Cipiko Palace in Trogir, the Catherdral of St. Marc in Korcula and the ruins of the house where Marco Polo was born. At their leisure, guests can explore the hidden beaches and lofty peaks of Hvar and the world-famous Postojna Caves–where guests will come face-to-face with the eyeless, dragon-like human fish and admire the cave’s most beautiful stalagmite. Best of Italy (10 days): Showcasing Italy’s grandest attractions, this remarkable journey takes guests to historic landmarks with a local expert such as the Vatican Museum, the Bramante Staircase, the Sistine Chapel and St. Peter’s Basilica. In Tuscany, guests will enjoy a guided visit through the house of the Italian Renaissance diplomat and writer, Niccolò Machiavelli, with a special opening of his private office where he wrote “The Prince.” Afterwards, guests can taste wines made from vineyards surrounding the home. They’ll also visit the Italian garden for a view of Florence’s iconic domed cathedral and explore the historic cellar connected to one of the oldest restaurants in Italy by a secret tunnel. On Giudecca Island, guests will admire the age-old skill of glassblowing by skilled artisans at an arts center, and in Venice they’ll ride on a gondola while being serenaded through the historic canals under starry skies. Guests will also take aprivate cruise to the Isle of sun-kissed Capri to enjoy breathtaking views of the Tyrrhenian Sea. Best of Spain and Portugal (15 days): This enchanting journey showcases the architectural masterpieces, regal history and delicious cuisine of both countries. In Madrid, guests will explore the magnificent Prado Museum with an art historian to admire the legendary paintings of Velazquez and Goya, while also touring the city with a local expert to pass by the elegant Paseo de la Castellana, the Cibeles Fountain to the Royal Palace and the monument to Cervantes in the Plaza de Espana. In Portugal, they’ll visit Porto, known as the capital of Port Wine, where guests can see Vila Nova de Gaia wine stores, walk along the corridors of casks and indulge in decadent wine tastings. In Fatima, they’ll explore the miraculous Basilica and the Chapel of Apparitions, which commemorates the appearance of the Virgin Mary. While in Lisbon, they’ll visit a traditional bakery that has a secret recipe of Portugal’s finest pastry while enjoying a taste of the famous Pasteis de Belem. For delicious, authentic dining, guests will visit the home of a local family in the town of Torremolinos to join in on a freshly-prepared traditional lunch with wine and hear stories about local life in Spain.